Decades in the future, the United States is no longer a democracy. 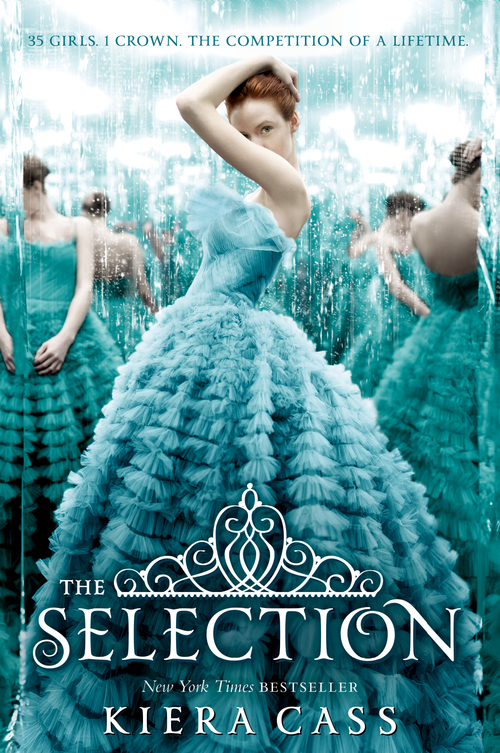 The government is ruled by a monarchy, social castes are the norm, and teen girls everywhere are obsessed with a government-sponsored competition known as the Selection. This months-long televised event documents the struggle of 35 young women to win the hand of the next prince. Against this backdrop, America “Mer” Singer, the daughter of poor musicians, reluctantly submits an application for the competition after Aspen, the love of her teenaged life, breaks up with her. She knows that her chances of getting chosen are infinitesimally small, but the promise of a generous stipend, but the opportunity to vault their family into prestige and power, is too much for her ambitious mother to let her pass up. I have to admit, for someone who hates love triangles I was surprised by how much I liked this novel. Cass makes a wise decision by keeping America and Maxon’s relationship (mostly) platonic, at least for this first volume of the series. The fact that they get to know each other as friends first, and love interest second, puts their relationship on an interesting level, and allowed me, as a reader, to take their budding romance seriously. In addition, the author manages to bypass most of the requisite melodrama that accompanies love triangles by keeping Maxon and Aspen separated for most of the story—until nearly the end, that is. On the downside, the supporting cast was pretty undeveloped, but I’m hoping that will be amended in the next book. (A final note to potential readers: a lot is set up during this founding installment, but the ending leaves a lot unresolved. If you pick this up at your local library, make sure you have the sequel, The Elite, close at hand.) Recommended for female teens of any age.